Epic Games is launching a competitor to Steam. The company today announced that it will soon open the Epic Games Store, a digital distribution platform that eschews Steam's standard 70/30 revenue split to give developers 88% of the revenue their games bring in. The Epic Games Store will debut with "a hand-curated set of games on PC and Mac," but the company expects to open the store up to more games and platforms throughout next year. The store will offer games built with a variety of engines, but Epic is sweetening the pot a bit for those using its own Unreal Engine in that it will waive all royalties it would otherwise be due for revenue generated through the storefront. The Epic Games Store will also have a "Support-A-Creator" program designed to reward YouTube and Twitch content creators for highlighting developers' games. GamesIndustry.biz had the chance to ask Epic Games founder and CEO Tim Sweeney about the company's plans for the store. Q: Why is the 30/70 revenue split that seems to have been the industry standard not appropriate here? Tim Sweeney: While running Fortnite we learned a lot about the cost of running a digital store on PC. The math is quite simple: we pay around 2.5% for payment processing for major payment methods, less than 1.5% for CDN costs (assuming all games are updated as often as Fortnite), and between 1% and 2% for variable operating and customer support costs. Fixed costs of developing and supporting the platform become negligible at a large scale. In our analysis, stores charging 30% are marking up their costs by 300% to 400%. But with developers receiving 88% of revenue and Epic receiving 12%, this store will be a profitable business for us. 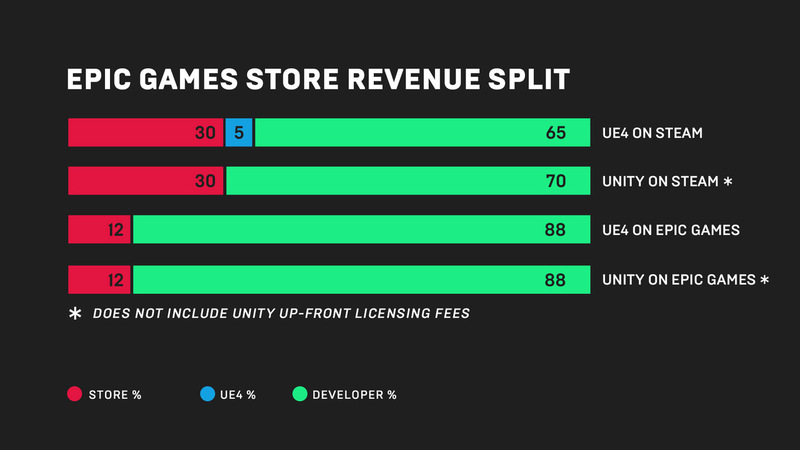 Q: Aside from the more favorable revenue split, what are you doing in terms of developer support to make the Epic Games Store more attractive for developers? Tim Sweeney: Epic's Support-A-Creator program is key to helping developers reach gamers. Content creators, such as YouTube video makers, Twitch streamers, cosplayers, community builders, and bloggers have become key influencers in gaming. Previously, most creators were not compensated by game developers for their work and instead had to rely on donations. By matchmaking creators with developers, the Epic Games Store makes it easier for players to discover games, and rewards content creators for their efforts. We also provide developers with direct access to their customers, through the newsfeed in the launcher and, if users agree, directly by email. Direct access to customers is critically important for developers, for sharing information about updates and new features, and for reaching those customers with subsequent game releases. One of the critical reasons Epic exited single-player, retail game development in 2013 was that each new release required a very costly new marketing campaign to reach buyers of our previous games. And then there are little things, like the store pages for games that have no ads for competing games, no mandatory sales, and no restrictions on cross-platform interoperability. Q:	What are you doing to make the Epic Games Store more attractive to consumers? Tim Sweeney: Among other things, the store will also feature one free game every two weeks throughout 2019. Epic is funding these free releases so players can experience the wide range of creative works that will be available. Q:	You plan to open up to more games in 2019. What's the right amount of openness you want for the Epic Games Store? Tim Sweeney: We'll have an approval process for new developers to go through to release a title. It will mostly focus on the technical side of things and general quality. Except for adult-only content, we don't plan to curate based on developers' creative or artistic expression. Q:	Are you planning to have forums and other community-led content in the store? If so, how are you planning to mitigate abusive behavior, review bombing, etc? Tim Sweeney: We don't plan to have forums. Users have generally migrated to Reddit, Discord, Twitter, Facebook groups, and other social media. Developers are free to run their own forums and social media and link to them from their Epic Games Store pages. We intend to add tools for players to communicate with developers privately, such as a ticketing system for bug reports and questions, to mitigate toxicity resulting from reviews being the only native communication mechanism. User reviews are still in development, and will be available as an opt-in for developers. We are experimenting with ideas for ensuring balance. Q:	Will you support mods? Free-to-play games? Non-commercial games? Tim Sweeney: We do intend to support mods, free-to-play games, and non-commercial games. Q:	Do you have a refund policy? Tim Sweeney: Yes. We're launching with manual refunds through player support, and automated refunds will follow soon. We expect to provide each user with "no-questions-asked" refund tokens to use in the first 14 days after buying a game. Q:	What countries will Epic Games Store operate in? Tim Sweeney: Epic Games Store is available to users in most countries in the world except for China and where prohibited by US law, such as North Korea and Iran. Certain regions, such as South Korea, may have additional legal requirements that developers may need to implement in their game in order to be compliant and to be distributed there. Q:	Are there any baseline requirements games will need to have to get onto the store? For example, would you require them to carry a rating, support certain languages, subtitles, implement controller support or the like? Tim Sweeney: Right now we're manually selecting games for the store, so there is no formal process. We'll announce further details as we work to open the store up more widely in 2019. Wow sounds very smart with the leveraging of Fortnite popularity and then Unreal engine as well. Steam could use some competition. I wonder what the store's policy will be on Early Access titles? There's still a large gulf between the way we're selling them in practice and the most recent UK digital goods regulations, which, I suspect, is only not a massive problem because most people don't know what they could do with it, or don't want to go to the hassle. Is the IGDA doing anything to address this, does anyone know? It seems to me that Early Access is sufficiently useful to want to keep in its current or similar form, so we might want an amendment to the law specifically for Early Access media, which allows return for full refund, as currently stated, but not the "or keep the product but claim back a proportion of the cost because it's not finished" (paraphrasing). Going back to the Epic Store, it's nice to see the lower rate. It seems kinda cheeky to charge the same as a human-staffed store for a mostly-automated platform that doesn't offer the same kind of thing, like cover for chargebacks etc. Excellent move by Epic. I'm not a fan of having hundreds of different digital stores - but I do think there's room for another good store and proper competition for Steam. Knowing how Epic do things, in the UE4 era at least, I fully expect that this will be amazingly well thought out and implemented. The only worry that I have: consumers... but coming off the back of Fortnite, Epic might just win on that front too. Not sure why Steam is still taking 30% of gross. MasterCard and Visa charge 2-5% per transaction, and CDN bandwidth is around $0.002/GB. So, Epic game store takes 12%, but the story above doesn't take into account what was mentioned in the announcement statement on their website. -To jumpstart the creator economy, Epic will cover the first 5% of creator revenue-sharing for the first 24 months. So, if I understand correctly Epic gets 7% of the revenue during the first 24 month. Hats off ladies and gentlemen, Mr. Sweeney is truly a man of his words and a truly great entrepreneuer distrupting the industry. Epic is making quite the bold move. I think they may well pull it off. As a consumer, i will not move away from Steam. I have +90 games in my list. I will not move away from my repository. This is why i never joined Origin Store (EA solution). As a developer, this is the push that steam needed to improve the services and business variety it lacked so far. I just hope they take this seriously. What countries will Epic Games Store operate in? Sad to see that regional pricing is not in place. Hades is $20 here in Malaysia, where the annual median income is $6,000. It's been a good number of years since Valve pushed their first regional pricing for games on Steam, and it's still overlooked far too often.